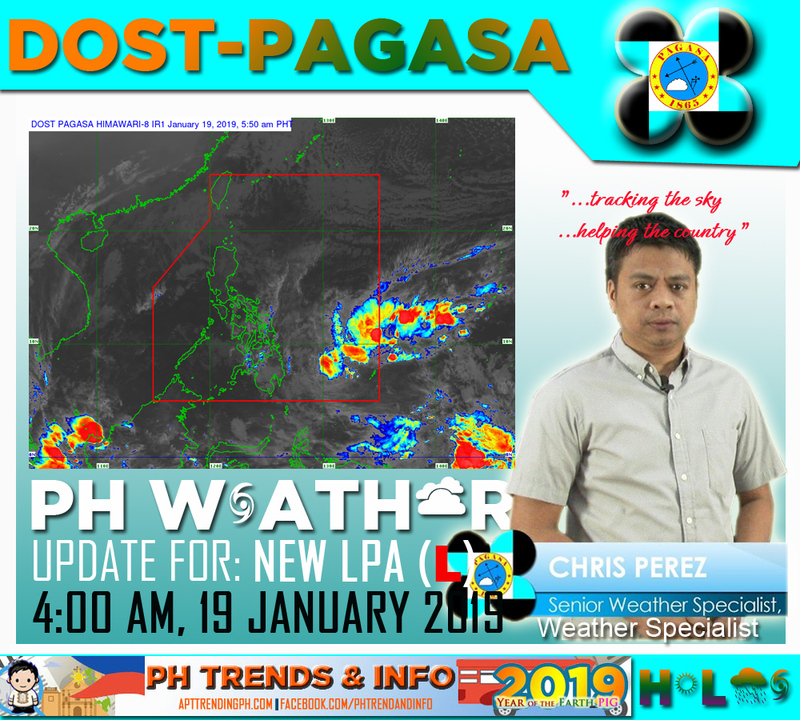 Home PAGASA DOST-PAGASA Weather Update for Amihan and LPA as of 4:00 AM 19 January 2019. DOST-PAGASA Weather Update for Amihan and LPA as of 4:00 AM 19 January 2019. Details: According to Chris Perez (Senior Weather Specialist), the LPA is located at distance of 1,170 km East of Mindanao (*3AM). If LPA enters PAR and became a Tropical Depression, it'll be named as "AMANG", the first name in the typhoon calendar for the year 2019. Eastern Visayas, Caraga and Davao Region will experience Cloudy skies with scattered rainshowers and thunderstorm due to Trough of LPA. Possible flash floods or landslides due to scattered moderate to at times heavy rains. Cagayan Valley Region, Ilocos Region and Cordillera Administrative Region will experience Cloudy skies with light rains due to Northeast Monsoon. No significant impact.